The 2010 Geno/Grinder builds upon the success of the 2000 model, maintaining the key features that make this homogenizer a valuable tool while remodeling the bead beater to make it more practical. The GenoGrinder still possesses the linear motion that is key to processing samples equally in microwell plates, racks of microfuge tubes, and vial sets. In the standard configuration, two deep well plates, two vial sets, or two racks of microfuge tubes can be processed per run. The new 2010 Geno/Grinder is lighter, has a smaller footprint, and is faster with a top speed of 1750 strokes per minute. The 2010 Geno/Grinder provides the highest throughput and most uniform sample processing of all mixer mills available to the scientific community. The applications are endless, but typically include high throughput processing of tissues for pharmacokinetic analysis, disruption of plant and animal tissues for nucleic acid isolation, lysing of environmental samples for the detection of microorganisms, and disruption of plant tissues for pesticide analysis (QuEChERS method). Samples can be processed in a variety of formats on the 2010 Geno/Grinder. In the standard configuration, tissue samples up to 150 mg can be processed in deep well plates using 5/32" grinding balls, or in pre-filled disruption (microfuge) tubes, while larger samples can be homogenized in 4 ml vial sets or larger customized grinding vials. Seeds can be processed in vial sets as larger grinding balls (3/8" stainless steel) are required, while pooled seeds can be ground in 15 ml vial sets. Microorganisms can be bead beat in pre-filled disruption tubes using small silica and zirconium beads, or in standard and deep well plates that were loaded with grinding beads. When the 2010 Geno/Grinder is fitted with the extended clamp assembly the number of samples can be doubled, thus four deep well plates or vial sets can be processed per run. However, the taller clamp assembly allows for homogenizing in 15 ml or 50 ml centrifuge tubes. This allows for immediate centrifugation of lysates following homogenization, thus eliminating the need to transfer the homogenate to a new tube for sample clearing. 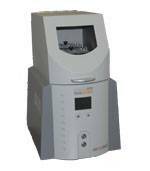 An additional feature of the Geno/Grinder is that the instrument can hold cryogenic blocks that hold microfuge tubes, 4 ml grinding vials, 15 ml polycarbonate vials, 15 ml centrifuge tubes, and 50 ml centrifuge tubes. These Kryo-Tech® cryogenic blocks are pre-cooled with liquid nitrogen and then act as a cold reservoir during processing of heat labile materials. These accessories provide a further dimension for sample processing on the 2010 Geno/Grinder.